Success' favorite child Suriya can never be seen complacent before any movie he acts. This is evident with his new action plan for his forthcoming movie's release even though he has had a habit of giving regular hits. 7aam Arivu, directed by A.R. Murugadoss, is set in two different backdrops. 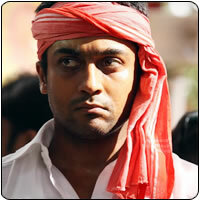 Interestingly, Suriya acts as a circus stuntman in one of his avatars in the movie. The perfectionist that he is, Suriya has had extensive training in rope fights, swinging on airs and martial arts for his role. Latest news is that Suriya would be performing these stunts on stage LIVE during the audio release of 7aam Arivu. The shooting of the film is being held at rapid pace as Murugadoss has already committed himself to direct a Bollywood action movie starring Akshay Kumar. "Working 18 days with Superstar"